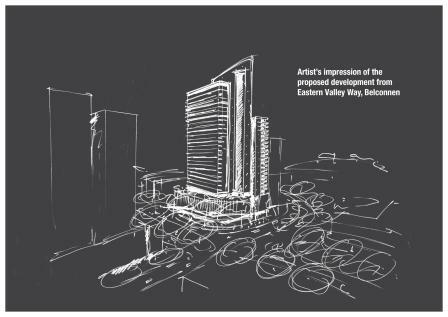 A mixed use development is proposed for the corner of Eastern Valley Way and Aikman Drive in Belconnen Town Centre. This 3 700 square metre site is located behind McDonalds and the bowling alley. The development will be approximately 35 stories containing commercial at ground level, a 168-unit hotel and 235 residential units. The residential tower is proposed to be 112 metres tall and the hotel tower 80 metres tall. Maybe if you Nimbys removed the stupid height limit in the city then you wouldn’t need this in Belconnen. But seeing as you’d all fight to the death to keep your utterly stupid R617 law we’ll have to settle for Belconnen. I give this my full support. Canberra can’t keep sprawling. I understand this “stupid height limit” in the city is a symbolic tipping of the hat to our war history- basically no building in the city can be taller than the highest point of the War Memorial. I personally think it’s quite respectful under that explanation. Its hardly befitting of the ‘Bush Capital’ to cut down hectare upon hectare of bushland to satisfy the aged who still wish Canberra was in the 1950’s. Don’t live in a Town Centre if you aren’t willing to put up with what goes up there. Its called a centre for a reason. Agreed. Don’t get me wrong – I love the quiet, open spaces that typify Canberra. I love that you are within 10 minutes walk of bushland no matter where you live etc. That’s why I live here. However I have no problem with dense, urban development, including high-rise, provided it’s controlled and clustered in the town centres. That’s what the town centres are for. It attracts people who like that kind of living, the kind of people that would normally not consider Canberra somewhere they’d ever want to live (because it feels ’empty’). But high-rise in the five town centres isn’t going to change things for those living in the suburbs … they’ll remain as they always have. The only impact might be that you see some high-rise buildings glinting in the sun in the distance next time you have a wander up in the local bushland. Continually sprawling outwards isn’t going to work for much longer – we’re literally hitting the ACT borders on the NE, NW and E. South is the Naas Valley and Namadgi so not much room there either. There’s still perhaps a bit of scope to the west (further down the Molonglo River corridor towards Uriarra or across the Murrumbidgee into the other side of the Tuggeranong Valley), but really, you’re better off just making the town centres more dense and encouraging medium density around the major transport corridors (as they have done pretty successfully two blocks deep either side of Northbourne over the last 10-15 years). Won’t impact the suburbs for those that still want to live there, and makes public transport more viable and efficient. Me thinks you may have lost the point. I hate it when people say ‘Me thinks’ when they mean ‘I think’. It it ye olde English actually, so not actual wrong.